I first performed a version of my Buzzing! show for the River Foss Society three years ago. I was thrilled when they invited me back to provide the entertainment for their 40th Birthday Party celebrations last Tuesday. Thrilled, and not a little daunted. This was a very special occasion, after all …. How fabulous is that?! What a wonderful Thank You present! 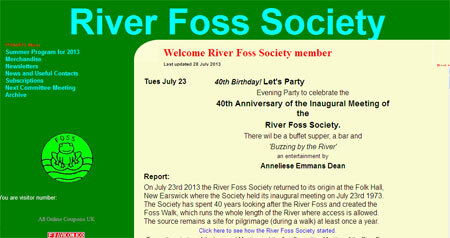 Not only does The River Foss Society do sterling work, it is also made up of the nicest bunch of people you could wish to meet here in York. If you’re the slightest bit interested in the river Foss and/or in walking and/or in matters ecological, I thoroughly recommend you think about joining them. Check out their website to find out more.